It’s mostly common sense. This book will be both helpful and entertaining. 2. Do not fear public transit. Public transit will take you within an easy walk of just about anywhere you want to go. And it’s cheap. 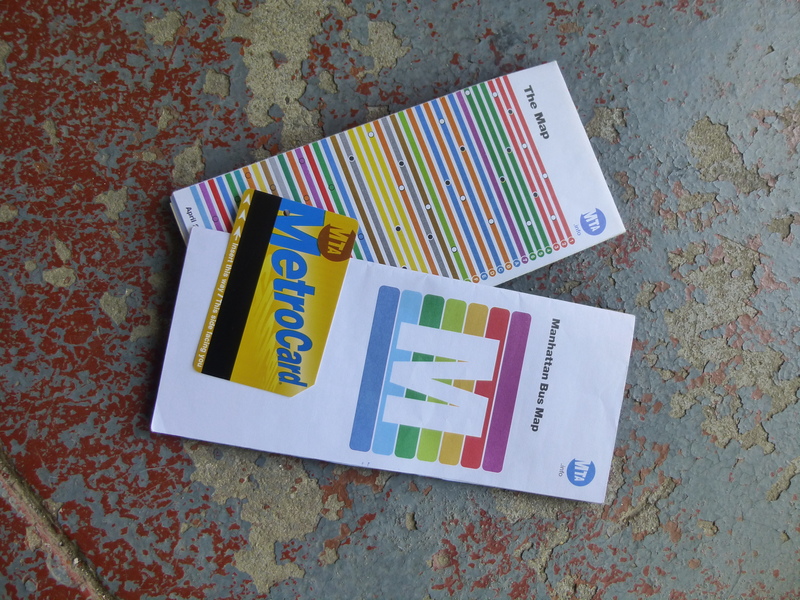 You can get a 7 day MTA pass that works for buses and trains for $30. You can pick up subway map and bus map easily, or download some of the MTA Apps. Locals and MTA employees are generally pretty helpful if you become disoriented. Tourists don’t seem to take buses much, but the routes are laid out efficiently with good information at the stops. They are quicker than walking for short trips, and can be give you a unique taste of the city on longer trips (Hint: Take the M4 bus to the Cloisters). 3. Check out the New York Pass. If you are planning to pack in all the tourist attractions you can in the shortest period of time, and a $25 admission for a museum, and a $40 admission for a boat ride, or view from a highrise creates some anxious sticker shock for you, you may want to deal with all of it in one payment by acquiring the New York Pass. It could be a real deal if you are doing power-touristing. Of course if you are power-touristing, you miss a lot of the nuance that makes New York the greatest city on earth. If you don’t have a lot of time you may want to avoid the bus tours that are hawked so heavily around Times Square. The tours move very slowly with long stops. You would do better (and save a lot of money) navigating by foot or city bus to see the sights. Remember, your MTA pass will give you unlimited rides, so use it in place of the hop-on-hop-off tour buses. This entry was posted in Culture on August 29, 2014 by Joe Spake. I have decided to start doing some real estate oriented posts on this blog. I realize many readers are happy in their homes, but others who know me know that I have been a real estate agent since 1996, and I do try to stay very current with the happenings in the industry. If you are currently in the real estate market as a buyer or seller, or if you have done any Google real estate searches in the last few years you have probably noticed that the local real estate companies, even the big ones, are not generally at the top of the search results. This entry was posted in Memphis on August 11, 2014 by Joe Spake. It’s hard to believe I haven’t posted here since March 7. It’s not like I don’t have time to post regularly; I mean one can’t spend EVERY waking hour binge watching the must-see TV series, or crafting witty posts and replies on Facebook and Google+. And I have kind of a job I have to deal with to take care of the bills. Well, maybe, when I get around to it. This entry was posted in Culture, Memphis, Social Media and tagged Blogging, facebook, hipster, Win-Win on July 22, 2014 by Joe Spake.